This speaks directly to adults who wish to overcome their 'mother gap' through reflections, exercises, and explanations. Many people feel something was missing from their childhood and wonder why their mother didn't seem there for them. Though she may have physically cared, for many, there remains a sense of having been a 'motherless child.' It is then difficult to maintain a relationship with her as an adult.The Emotionally Absent Mother helps readers understand why their mother was so unable to provide what many others were able to.This expanded edition will describe how to:*Identify the impacts of emotional neglect and abuse *Assess options for your adult relationship with mother*Find the child inside of you and learn to mother that child *Take charge of your healing and learn to make up for what you missedThrough reflections, exercises, and clear explanations, psychotherapist Jasmin Lee Cori helps adult sons and daughters heal the wounds left by mothers who failed to provide the essential ingredients that every child needs. She traces perceived personal defects back to mothering deficits, relieving self-blame, and shows today's undermothered adults to cultivate the mothering they missed, thereby helping to secure a happier future - for themselves and their children. "This book is a revelation to those of us whose mothering was short of what we needed. The author sensitively and authoritatively weaves developmental principles into a compassionate understanding of what it means to be under-mothered." "With compassion and sparkling clarity, Jasmin Lee Cori describes the effects of being under-mothered and what it takes to overcome them. Her book will be of great value to new mothers serious about creating a loving environment for their children, adult sons and daughters who want at long last to fill the holes in their hearts, and clinicians interested in understanding and healing the mother wound." 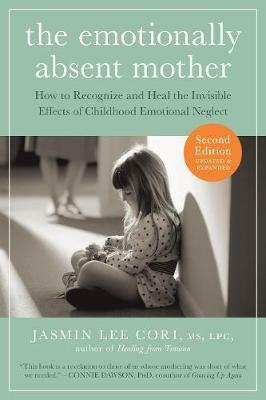 "Jasmin Lee Cori has done a superb job of describing the importance of childhood attachment needs and the psychological wounds that get inflicted when an emotionally absent mother cannot meet those needs well enough. She has skillfully laid out clear steps wounded adults can take to identify their inner strengths and heal attachment wounds. I wholeheartedly recommend this book for anyone who wishes to understand and heal the wounds that can arise when parented by an emotionally absent mother." "This book effortlessly intertwines neuroscience with clinical acumen in a lovely work of extraordinary depth. In her compelling, heart-rending analysis of the importance of motherhood, Jasmin Lee Cori has created a work as significant as Alice Miller's Prisoners of Childhood. Easily accessible and very useful, it is a must-read for parents-to-be, those in the helping professions, and adults who have been wounded by a negligent parent." "With a compassionate and steady voice, Jasmin Lee Cori guides the reader through the difficult terrain faced by adults who have grown up without sufficient emotional mothering. Relying on personal experience and practice as a psychotherapist, she provides insight and tools to help readers overcome the challenges of a painful childhood and to move into the pleasures of living adult life fully."